What is your impression from the workshop and its participants in Vienna? Vienna is such a great place to teach! I had people come from many different countries because Vienna is so easy to travel to from other areas of Europe and the Middle East. Was it your first time in Vienna? Are you coming back? I hope I will return to Vienna! It was my first time in Austria altogether, and Vienna is definitely beautiful. Could you tell one thing that differs Viennese people most from Americans? Well, I was only there a week, so I can’t say I understand Viennese culture at all, and in my experience no matter where you go in the world, people are people. We are all actually so similar! But I did notice I got some glances of disapproval for crossing the street without waiting for the signal, even though no cars were coming. Maybe Viennese people like to stick to rules more than Americans haha! Since practicing yoga: What changes did occur in your life? How often do you practice yoga for yourself? In terms of asana, I practice a little bit every morning, usually just 10-30 minutes, and then I may do some other things later in the day depending on how I feel. But throughout my day I use what yoga has taught me. I take moments to just breathe and be present, to be mindful in what I’m doing and how I do it, whether it’s walking to catch a bus, or eating my lunch. Nowadays, time is often luxury. Which three yoga positions would you recommend for a daily practice if I don’t have a lot of time? 3: Exhale fully. Those are the three most important movements you can make. Try it now! See how you feel! What is the biggest “mistake” I can do while practicing yoga? Is there any hint you could give our members for being more stressless? Breathe. A few deep breaths to calm your mind and body when you’re feeling stressed is so powerful, even if it seems too simple. What matters most in your life? Could you tell me three points? My spiritual practice has become the most important thing in my life, because it has helped me realise that everything else in our physical world – our material possessions, the labels we assign to ourselves or allow others to assign us – are not constant or absolute, and therefore any attachment to them is a mistake. What is constant, what remains, when I take away all the ‘stuff’ around me, and the words we use to describe this stuff? What remains is me, my connection to others, to the original, infinite source (one may call that God). Besides being a Yoga teacher, you are a health coach with a holistic view of life. What are the three worst habits for you and what can people do for a healthier lifestyle? I see health as a journey, rather than some destination you arrive at when you’ve figured it all out. So my health journey has me currently with a slightly bad habit of enjoying too much coffee. But I don’t beat myself up about it, because I know it’s just a part of my journey right now. For a healthier lifestyle, well, everyone is different and on a different path in their own health journey. I think generally, drinking more water in place of sodas or juices can vastly improve health. Eating more vegetables and any foods that are the way nature intended them to be — organic, unprocessed, not wrapped in plastic, not altered from how nature provided them to us — is also very important. Basically just living and eating in the way that nature provided for us. Is there a person that inspires you most or do you have any other inspirations beside a person? As a teacher, I’m inspired by my students. And in the same way, I take inspiration from everyone around me in my everyday life. I believe we can learn something from every single person. Do you have any mission statement? Are you already accomplishing your mission in life? 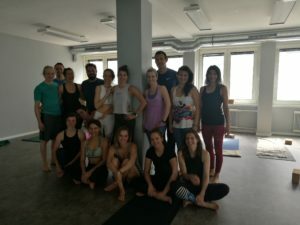 My mission is to share my passion for yoga and health, and to share the idea that every person is unique and beautiful and perfect in their own way. That while, for example, the practice of yoga is generally very beneficial for everyone, each person’s practice will look different because each person is living in a different body. And so I always encourage people to listen to their own bodies, and learn to understand themselves, their thoughts, their emotions, their feelings, and so each person can work out what is best for them. We humans love to just follow a guideline or a recipe, and be told how to do something. But to feel great inside and out, we have to put the work in to understand for ourselves what is best. When waking up: What is the first thing you are doing? I always start my day with gratitude. I look around me, and then look within myself, and focus on everything in my life that I’m grateful for. Thanks a lot, dear Adell. We are really looking forward seeing you again next year!